A set of comic books aiming to raise children’s awareness of unexploded ordnance (UXO) accidents in Vietnam made debut in Hanoi on December 14. The comics, compiled by the Vietnam Bomb and Mine Action Support Association, consist of three collections, namely “Peter va mua he tren dat Viet” (Peter and the summer in Vietnam) with five volumes, “Bi mat lang da tang” (The secret of the stone village) with three volumes, and “Nhat ky Sau heo” (The diary of Sau heo) with three volumes. 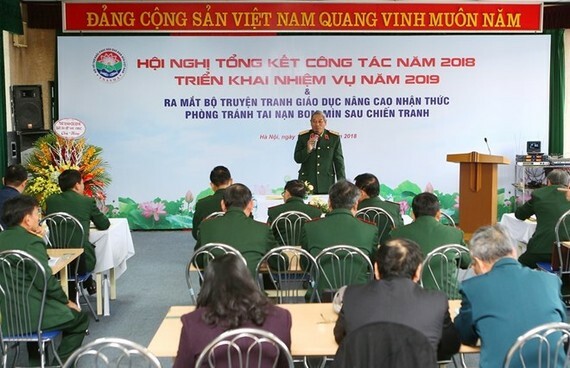 Lt. Gen. Pham Ngoc Hoa, Vice Chairman of the association, said about 3,000 copies of the comics have been printed, and they will be distributed to some primary schools in the 19 most UXO-contaminated provinces and cities. He noted that there are many measures to eliminate UXO-related accidents, and education to raise public awareness has proved highly effective. He expressed his hope that the comics will help improve local children’s awareness of this type of accidents. 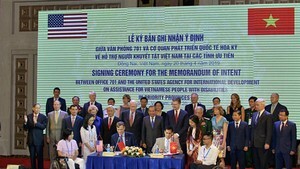 According to the Ministry of Labour, Invalids and Social Affairs, Vietnam is one of the world’s most UXO-contaminated countries. It is estimated that about 800,000 tonnes of UXOs were left across the country after the war ended, mostly in the central region. Some 6.13 million hectares of land are polluted with or suspected of being polluted with UXOs, accounting for 18.82 percent of the country’s total area.